According to TSN Edmonton Bureau Reporter Ryan Rishaug, the Oilers are "open to trading" winger Jesse Puljujarvi, but only if a proper return can be found. Rishaug reports the Oilers spoke with Puljujarvi's agent on Friday and the team is considering sending the 20-year-old to the AHL to help boost his confidence. Rishaug adds that the return for Puljujarvi would have to be quite high, since the Oilers still believe in the 2016 fourth-overall pick. Puljujarvi has four goals and nine points in 45 games this season. He topped 14 minutes of ice time for just the second time this season in Wednesday's shootout loss to the Pittsburgh Penguins. The Finnish winger spent four games in the AHL earlier this season with the Bakersfield Condors, posting two goals and four points. He had 12 goals and 20 points in 65 NHL games with the Oilers last season and one goal and five points in 10 games with the Condors. Keith Gretzky is currently operating as the Oilers interim general manager after the team fired Peter Chiarelli last month. Oilers CEO Bob Nicholson stated after parting with Chiarelli that the team wouldn't trade their top prospects "unless we get some real good pieces back." 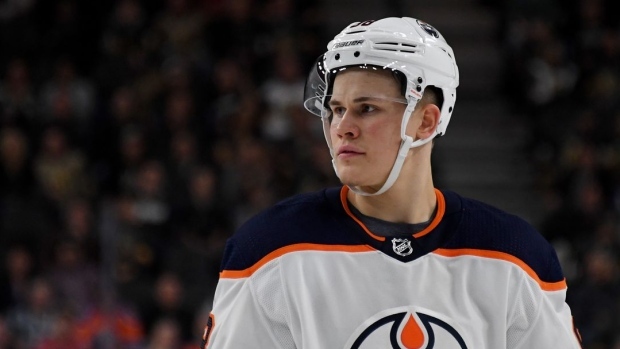 TSN Hockey Insider Darren Dreger said Thursday that he does not believe Puljujarvi will be moved at the deadline, stating the Oilers have placed too high a price on him. “It looked like Puljujarvi played better (against the Penguins) didn’t it? That’s how it looked," Dreger said on TSN Radio Edmonton 1260. "Can he string that together on a consistent basis? Well, he hasn’t been able to to this point. “Again, if I’m management in Edmonton, you’re trusting Ken Hitchcock and the coaching staff right now. So lean on them. Find out what they believe to be the long-term upside of Jesse Puljujarvi. Now, you’re asking to look into the crystal ball and make a prediction, and often that’s really difficult to do with young, developing players. “I can appreciate why Edmonton wants to continue to hold on to this young man, because they don’t fully know what his potential is. But if the feedback from your coaching staff is, ‘Well, we don’t really see him as being much better than a third-line player in the NHL,’ well cut bait. “There is a trade market for Jesse Puljujarvi, but my understanding is that the Oilers just want too much - the ask on him is way too high. I don’t even know what that is. I can take a guess at it when you start talking about either a top prospect or a first-round pick obviously plus something given where he was drafted. “But I don’t get the sense that Puljujarvi has much, if any, interest in going to Bakersfield and playing in the American Hockey League. Doesn’t have a choice organizationally, so if the Oilers want to take a tough stand on him, then so be it.